Israel’s expropriation of Bedouin lands: The Jewish state’s other land grab. The Palestinians aren’t the only people losing their lands to the Jewish state. Abu Aziz stands outside his tent in the village of al-Arakib, one of the dozens of ramshackle Bedouin Arab communities in the Negev desert that are not recognized by the Israeli state, in southern Israel on Aug. 18, 2013. In August, despite the fragility of the newly resurrected peace talks between Israel and the Palestinian Authority, the Israeli government announced plans to build 1,187 new housing units for Jews in East Jerusalem and the West Bank. This announcement came hard on the heels of the 1,096 new units promoted by the Israel Defense Forces (IDF) Civil Administration and the 91 settlements the government recently added to the “national priority list,” presumably rendering them non-negotiable. With the eyes of the world focused on this defiant expansion of Israeli “facts on the ground,” few were paying attention to a simultaneous land grab taking place in the Negev: Israel’s systematic expropriation of areas that for generations have been inhabited by Bedouins. On my first trip to Israel 37 years ago, I was hosted for dinner in a Bedouin tent in the desert. Our delegation of eight or 10 American media types sat on beautiful hand-loomed rugs. We ate with our hands. We heard about Bedouin culture and traditions. The men who sat with us in that tent (the women were behind a curtain, though we saw one peeking out) were warm, welcoming, and responsive to our questions. Only later did it occur to me that our travel agent or the Israel tourism authority was paying the Bedouins to exhibit their “native” ways to visiting foreigners. And while other stops on our itinerary—Masada, Mea Shearim, Rachel’s Tomb—were introduced with extensive background information, the Bedouins were presented as ethnic exotica, a people without a history. Only later did I wonder how they really felt about these encounters. Since then, the Jewish state seems to have become markedly less appreciative of Bedouin culture and traditions. Hundreds of times during the last few years, Bedouin homes and villages have been summarily demolished by IDF and Jewish National Fund (JNF) bulldozers. Media sources and advocacy groups such as the Association for Civil Rights in Israel, the Campaign for Bedouin-Jewish Justice in Israel, and the New Israel Fund report that Bedouins have been beaten, shot, and forcibly evacuated from their ancestral lands so that this fertile area can be developed for Jewish agricultural development, JNF forests, and Jewish habitation. In 2007 the government appointed the Goldberg Commission to address the Bedouin “problem.” (Needless to say, there were no Bedouins on the commission.) Their findings led to the Prawer Plan, a proposed law that would relocate up to 40,000 seminomadic Bedouins, concentrating them in seven “officially recognized” urban townships that rank at the bottom of every Israeli socioeconomic measure, with an infant mortality rate four times higher than that of any Jewish Israeli community. Last June the Prawer Plan passed its first Knesset reading by a slim majority. The final two readings needed in order for the Knesset bill to pass are expected this month. Somehow, it’s unthinkable to evacuate thousands of Jews from their West Bank settlements in the interests of Israeli-Palestinian peace. But expelling 40,000 Arab Israeli citizens from their homes for the sake of Jewish development is considered acceptable. Moreover, Israel presents its transfer policy in a benevolent light, as if by trashing Bedouin dwellings, the IDF is expelling these noble savages from their “primitive” habitats for their own good. Mind you, I’m not romanticizing the Bedouins. They don’t just keep their women behind a curtain; they keep them uneducated, isolated, and cut off from modern health care. And though they are not responsible for their extreme impoverishment and rampant unemployment, these conditions have spawned alarming rates of criminal behavior and drug use. 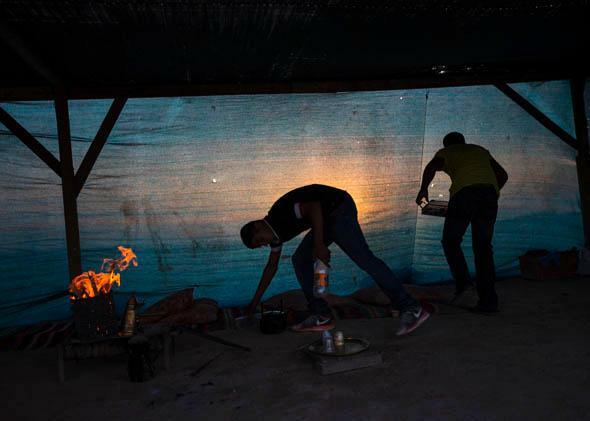 Bedouin youths work in their tent in the village of al-Arakib. Likewise, I’m mindful of the legal complexities of the land use issue. The Bedouins don’t hold title; their system of land acquisition and ownership recognition is based on oral agreements that date back to the Ottoman Empire. Expecting them to produce airtight proof of ownership of territory they’ve inhabited for centuries would be like asking Native American Indians, who believe the earth cannot be owned, to produce a deed from Christopher Columbus, or asking the Australian Aborigines, who mark territorial borders by transmitting “songlines” known only to the indigenous tribes, to produce transmittal documents signed by the British. 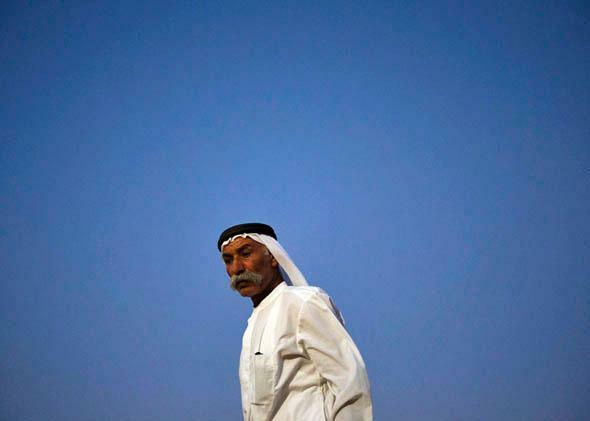 The bottom line is that Bedouin Arabs are citizens of the state of Israel. Some of their elders fought with the Palmach, the early elite fighting force that preceded Israel’s founding. Many Bedouin men have volunteered for the IDF, serving as trackers and defending the country’s borders. Yet these citizens are being targeted for internal dislocation on the basis of their ethnicity, race, religion, and normative social arrangements. And Israel shows little respect for their historic ties to the land. Rather than herd them into the seven ghettolike “recognized” villages with inadequate services, pathetic infrastructure, and few jobs, Israel should improve the conditions of everyday life for Bedouins in the 35 “unrecognized” villages. The government should invest in Bedouin roads, schools, job creation, and health care, and connect these villages to the Israeli water, sewage, and electricity systems. Likewise, rather than turn a blind eye to the ongoing injustice of forcible Bedouin dislocation, American Jews should think twice before buying a tree from the JNF in a forest that may have been created on the ruins of Bedouin homes. And Jews in the United States should insist that our communal organizations address both the moral and political dimensions of this issue. Israel cannot claim to be “the only democracy in the Middle East” if it continues uprooting thousands of its citizens against their will.